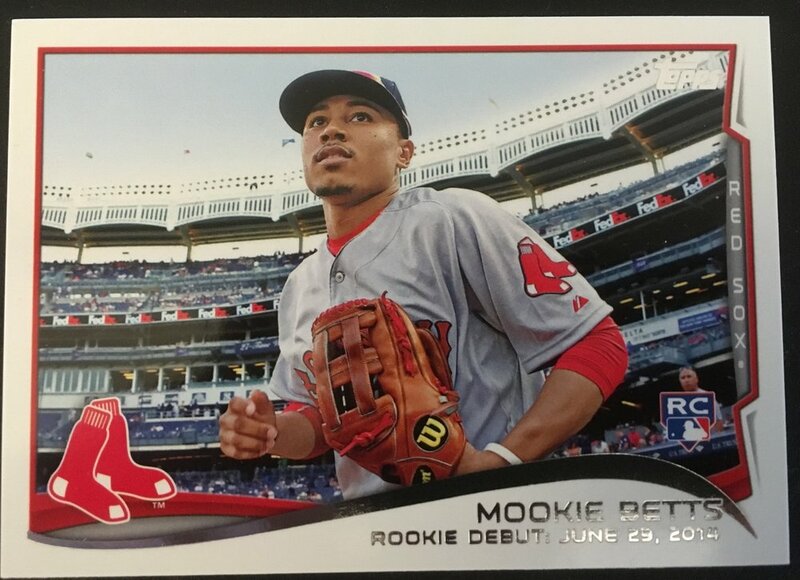 As I began rebuilding my collection in late 2015 and early 2016, I started picking up Betts cards in the dime box at my local LCS and 2014 RCs for $5 or less. Despite his strong performance on the field, those prices continued more or less unchanged for the next couple years(at least here in Central Illinois). Finally, as his record breaking 2018 season progressed, prices started to rise, and his rookie cards started to rise significantly. I guess being the first player in MLB history to win the MVP, Silver Slugger, Gold Glove, batting title, and a World Series in the same year was enough to get some notoriety outside of the Northeast! Despite the rise, there are still some pretty sweet cards that you can pick up on eBay, Sportlots, and COMC for less than $5! I present to you the next installment in the “7 Awesome Cards” series. Let’s start with his 2014 Bowman paper 1st Bowman. 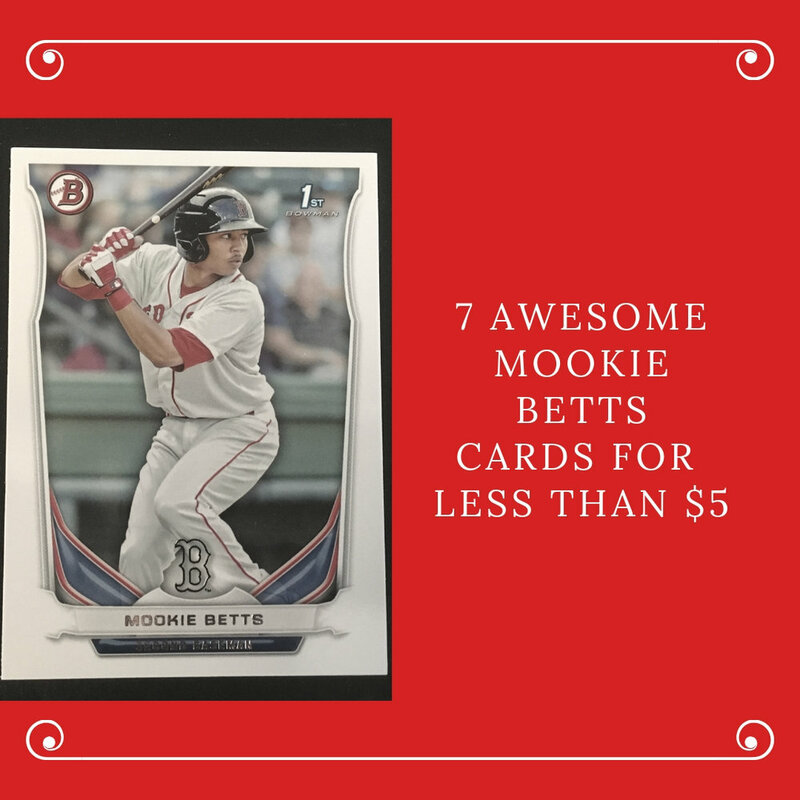 This is one of the first Betts cards available, and I love the the photo and design of this card. The intensity in his face as he prepares to hit the ball is awesome. While chrome and colored parallels of this card have started to rise, you can still pick up the paper version of this card for well under $5. Ok, due to the continued appreciation in prices this one may become dated soon after the publishing of this article, but as of March 2019, this card still had sales on Ebay for right at $5. How can you overlook a RC logo flagship card at this price? If I’m building out a Betts collection on the cheap, I’m definitely picking up one of these. Some people don’t like the horizontal shots, but that is really the only negative thing to say about this card. While Kris Bryant’s RC may garner the most attention from 2015 Topps Series 2, the card depicting Betts’s follow through is one of my favorites. Add on the Future Stars designation, and you have a great second year card to add to your collection for less than $1! This is the first “retro” card of the list. As you’ve seen from some of the other posts, I love Heritage. The 2017 game insert card is just awesome. 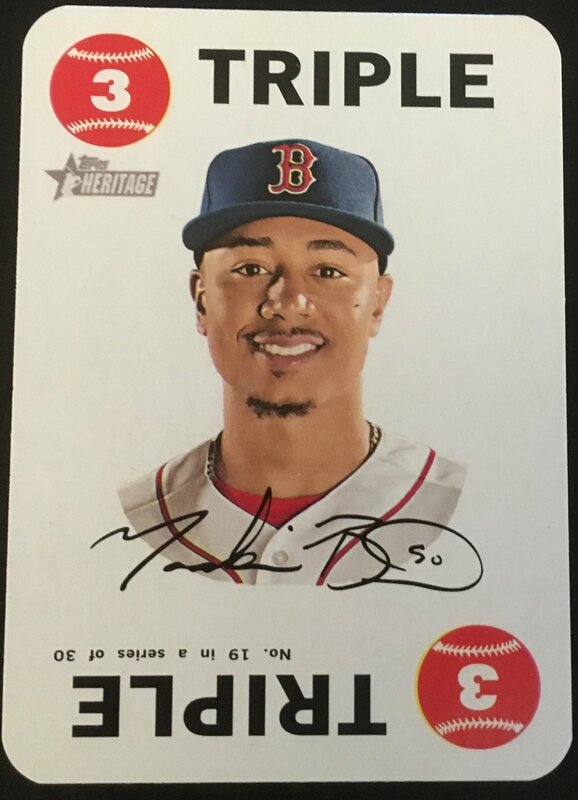 The rounded corners, the smile, the facsimile auto, and the throwback feel are just great. 1987 is another of my all-time favorite Topps sets. How can you not like the 2017 insert which uses this design? The photo, 30th anniversary logo, and overall design are perfect in my opinion. Again, for less than 50 cents you can’t beat this card! Should it really be a surprise at this point that Stadium Club would provide an awesome photo? Well, the 2015 Betts photo appears to show him suspended in mid-air after making a throw. Today he spends most of his time in the outfield, but early in his career he spent time on the infield as well. This is one of the few cards that captures a moment of him presumably manning second base for the Sox. I have a preference for licensed Topps card, but as I mentioned in my review of 2019 Donruss, there are certain “logoless” Panini cards that are fantastic. The 2019 Donruss Diamond Kings card of Betts is one of them. The 1985 style is awesome, the artwork is awesome, and the fact there is not a Red Sox logo is not even noticeable. You can get this card for 18 cents plus shipping on Sportlots! What do you think about these cards? I pulled them from the 92 cards I currently have in my Betts PC. Are there others you’d suggest? Let me know in the comments below! If you like this, check out the Mike Trout, Kris Bryant, Nolan Ryan, and Bo Jackson posts in this series!